As we first mentioned on Twitter, Apple has started to run two new iPad Mini commercials. Both ads are themed similarly to the iPad Mini Piano commercial, showing the Mini alongside the standard sized iPad and performing a variety of tasks. Both videos have been embedded below for easy viewing. 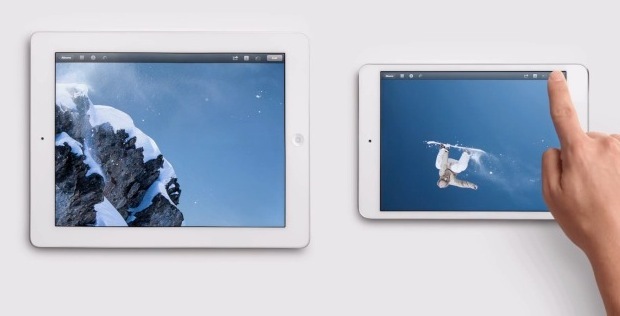 The first commercial is titled “Photos”, and it shows the iPad Mini and iPad flipping through iPhoto pictures together, with the classic Bobby Darin and Johnny Mercer song “Two of a Kind” playing in the background. The second commercial is titled “Books” and shows an iPad and iPad Mini going through a variety of classic books within the iBooks application. Both commercials started airing during NFL football games on Sunday, and were later shown again during 60 Minutes and other primetime television spots. I can’t watch your videos, the are just black squares in the mail. I run mac 10.7.5 . It’s just you, it’s fine for me but I’m on 10.8. Wow, that commercial really shows the difference between the displays.